Bringing the versatility of one of the best office products in the marketplace to the Apple OSX 10, Microsoft released the sensational Office: Mac professional edition, bundled with Virtual PC. Having used a Mac for some time as a graphic designer, I was very keen to see how Office behaved in a non Windows environment, being that up until now I've run both PC and Mac for different functions quite happily, taking the best out of both worlds. The first thing that users will notice is the beauty of this suite, that's right, from a design perspective Office is truly a thing of glorious shapes and interactivity. Icons are gorgeous 3D images that have a life of their own as they sit in the dock of your PC. The aesthetic is such that you will not see where the OS ends and Office starts. It really makes you wonder why Windows can't look as good or operate in the same manner as it's Apple counterpart. Bringing the two worlds of PC and Mac closer together, Office: Mac applications like Word and Excel are interchangeable between the two machines and the email system in Entourage has consistency with other parts of the Office suite allowing Mac users to get the most out of MS Exchange Server setups, along with the remote email programs like hotmail and the like. This level of interaction in a mobile sense is a great move forward that will allow professionals on the move to have a greater degree of access to office communications whilst on the road. In Word you can annotate recordings and graphics to your primary files in a Notebook type addition to the software. It acts as a quick reference which can then be structured like a personal organiser or a filofax type arrangement. Another innovation which I think really should be thrown over to the PC version of the software is the Scrapbook function where you can copy notes and other bits and pieces in and the information entered will be available to every other program in the suite. When testing and using this software, the Scrapbook was such a timesaving feature that it simply has to be seen to be believed. The software is totally in line with the Mac ethos of making every feature simple to use and attractive in a design sense. I think that Excel is one of those old MS Office staples that for me really got to shine in Office: Mac. There are so many new features that have an extreme wow factor that makes me pity those who are stuck on just the one operating system. There are so many ways that you can customise what previously was a boring, albeit powerful program that Excel simply looks like a new beast. With an eye to exquisite design, the entire suite is one that will actually make using Office an art form. When you bring in the functionality of the scrapbook and Notebook across the spectrum you know that they weren't joking around when putting this one together. 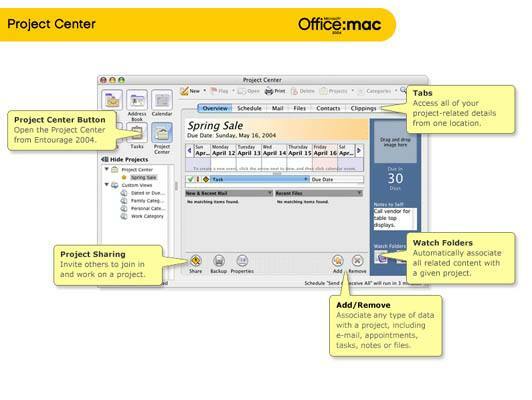 Presentations are now streamlined attractive propositions with Office: Mac Powerpoint. A great feature of the software is that it has a timer built in so you know how to stretch and time your presentation and there is an onscreen clock that will show you how are you are going with the overall project. Why it hadn't been thought of before I simply don't know. 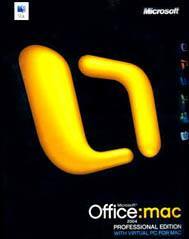 Office: Mac has been developed with the assistance of the online Mac community and even Apple agrees that Microsoft has listened which is great considering the relationship that the two companies have had in the past being direct competition with each other. The new PowerPoint has built in ability to also help users sort out the order of their slides and also work out the layout of the presentation so that nothing goes awry when it is time to formally introduce the work. Office: Mac also sees the introduction of a bevy of great slide transitions and other animation tools that ensure that you are always looking your best. The simplicity of this software will have you dragging and dropping great presentations shortly after start up. I do believe that across the board that this software is far more intuitive in so far as it's appearance and ease of use. I think that part of the problem might lie in that Microsoft knows that almost everyone has used their product before and as a result there is a difference in the way that the program behaves from others. 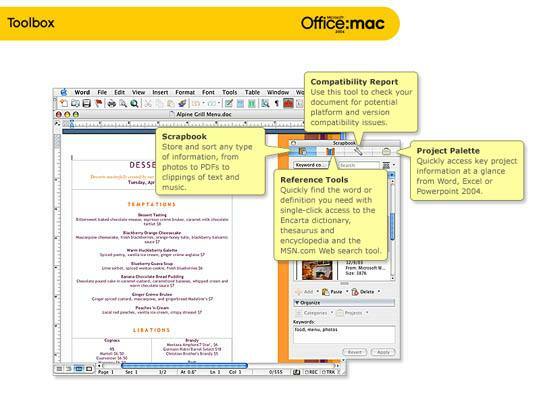 The Office: Mac version is a pleasure to use, easy to understand and a delight to behold. We are lucky enough to get the Pro edition of this software to review and as such were treated to the new version of Virtual PC that is bundled with this package. Sensational! This handy utility is what everyone has been dreaming of for some time, a program that will allow you to run most Windows based applications. For those gamers among us, forget about this being a solution for you to play Windows games, the system absolutely chugs along and is a waste of your time and effort. When it comes to using your Mac in an office environment that is run under Windows you are going to enjoy the plug and play aspect of this revolutionary software. Once your Virtual PC is installed, you will find yourself with a Windows shell on your desktop that will allow itself to be manipulated like any other program on your Mac, it's simply the Windows XP operating system. It's such a complete install that users can change the desktop settings and other aspects of the software that Windows users take for granted. In summary, this is a program that you simply cannot afford to be without. It will allow Mac users to get a real taste of the world of Microsoft Office and with the power of Virtual PC 7, outstrip the experience that PC users are having with their software. The entire suite is incredibly smart, intuitive, attractive and as far as I am concerned, absolutely brilliant. I had no problems using any aspect of the software and as long as gamers realise that it is not for them to play games on, Virtual PC is an incredibly powerful piece of kit. This is a fantastic example of two companies working in harmony to produce a sensational product that has high production values and is truly in line with the Mac ethos. A MUST HAVE application and I recommend it to everyone who is looking at being able to interact effectively within the massive PC Windows driven world. Office: Mac has the goods and works like a dream. · Hardware: 700 MHz native* PowerPC G3, G4 or G5 processor. · Operating System: Mac OS X version 10.2.8-10.3; Mac OS X version 10.3 is required for the Power Mac G5. · Memory: 512 MB of RAM . · Hard Disk1: 3 GB of available hard disk space. · CD-ROM or DVD-ROM: CD-ROM drive (or connection to a local area network if installing over a network). · Input Devices: Mouse or compatible pointing device. · Modem: 14.4 Kbps or higher. · Internet Access: Internet connection through either an Internet service provider (ISP) or a network. Internet access might require a separate fee to an ISP; local or long-distance telephone charges might also apply. *Upgrade cards and accelerators are not supported. 1 The hard disk should be in Mac OS Extended (HFS+) format, the default format for Mac OS X. Although you can perform a drag-and-drop installation of (and run) Office 2004 from a hard disk that is in another format, Microsoft does not currently support such a configuration. To determine the format of your hard disk, on the Apple menu on your Mac, click About this Mac, and then click More Info. · Hardware: A 700 MHz native* PowerPC G3, G4 or G5 processor. · Operating System: Apple Mac OS X version 10.2.8 or later; Mac OS X version 10.3 is required for the Power Mac G5. · Hard Disk: 3 GB of free hard disk space. · Memory: 512 MB of RAM.